What a cold start to a great weekend! We could not believe it when it snowed on Saturday, the only snow we have had all year and it came in April and with a biting wind to go with it. Apart from that, it was bright and dry for the second round of the East Anglia Schoolboy Scramble clubs second round of their summer Club Championships at Wakes Colne. Wakes has undergone some changes over the Winter and it was the first time we had ridden on the new layout and I must say it was a great improvement. The track road well all day and we avoided the bog that caused so many problems last year. The day started off with the Juniors taking to the field, Charlie Richmond had a great day coming in third in the first race but then consolidating his lead with two wins to take first overall. Kayden Smith reversed that with a win in the first race followed two seconds. Riley Ingram had a mixed bag but it was enough to get the third spot. The Small Wheel 85’s were out next and Hayden Harris went into the lead with wins in races one and two. A disappointing third race was not enough to keep him out of the overall lead. Chester Hyde took second overall and Rocco Hands came in third both with a mixed set of results. Thomas Harris dominated the Big Wheel 85’s with three straight wins. Baylis Utting had a fourth and two thirds to take the second place and Harrison Forde reversed that order and got the third place. 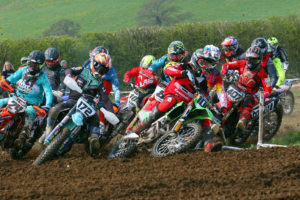 The Youth group is split into two, with the Youth 125’s and the Youth open running together. They are split in the Club Championship but not on the day. William Farrow riding in the Youth 125 group took the overall with a win in the second race and two seconds. Adam Caroleo took the second spot and Callum McCaul took third. MX1 was the next out and Ben Cole took a decisive lead with three straight wins. Harry Clark had the second place and Rob Nicholl had third in what was a very close contest. The Vets were out next and as with the youth we run two groups together, over 35’s and over 45’s but all are scored together on the day. Cliff Lester took the overall with a third, first and a second. Paul “Wildman” Willis came second with a third and two seconds with Sean Hodgeson taking the third place. MX2 saw Ryan Allison fighting hard with two seconds and a first to take the overall from Todd Richie who reversed that order. Toby Avis also had a great day with a fourth and two thirds, which was enough to give him third overall. The Auto’s were the last out and rode the whole track in the second round of the East Anglia Auto Challenge and what a fantastically brave bunch they all were. Riley- Ray Barrow took a commanding lead start to finish with three straight wins. Tyler Rogers was the next with two third places and a second and Chase Panter took the third place overall.